CL Series amplifiers provide 2-, 4- and 8-ohm options per channel for applications where high power, low impedance loads are the primary requirement. 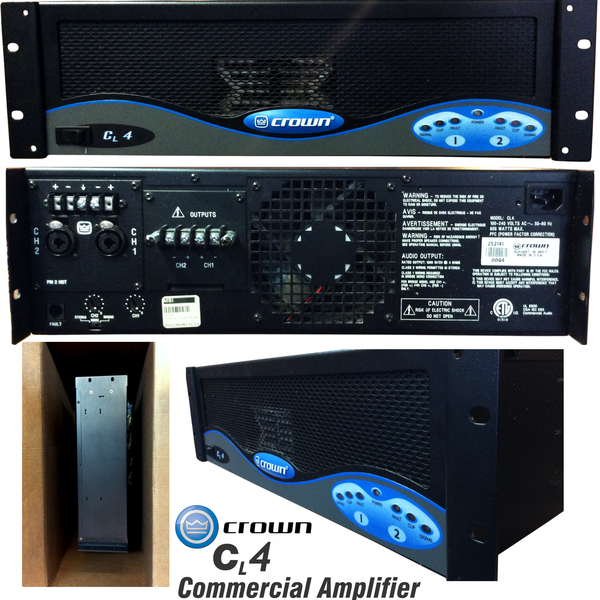 CL Series amplifiers can directly drive constant voltage lines, avoiding the expense of adding step-up transformers for distributed loudspeaker systems. Packed in original carton; cosmetically “excellent” to “near perfect” condition (see photos). • Low impedance compatibility for applications where high power, low impedance loads are the primary requirement. • Rear panel detented level controls allow for accurate level settings and secure operation. • “Contractor-Correct” barrier strip output connectors allow for quick and easy connection, regardless of the load. • Active crossover with signal routing available with optional System Solution Topology modules. • 5-Way Fault Indicator serves as a valuable system troubleshooting aid by quickly alerting the user of potential problems. • Advanced protection circuitry guards against: shorted outputs, open circuits, mismatched loads, DC, general overheating, high-frequency overloads and internal faults. • Can be mounted in standard (19-inch (48.3- cm)) rack, shallow (14-inch (35.56-cm)) rack, or stacked on top of each other. • Accurate, uncolored sound with very low distortion for the best in music and voice reproduction.